World Superbike championship leader Sylvain Guintoli heads to Assen with the Aprilia Racing Team with great memories and growing confidence. The Frenchman hasn’t been outside of the top two in the opening races of 2013, and heads to the legendary Dutch track in the best possible physical and mental conditions. 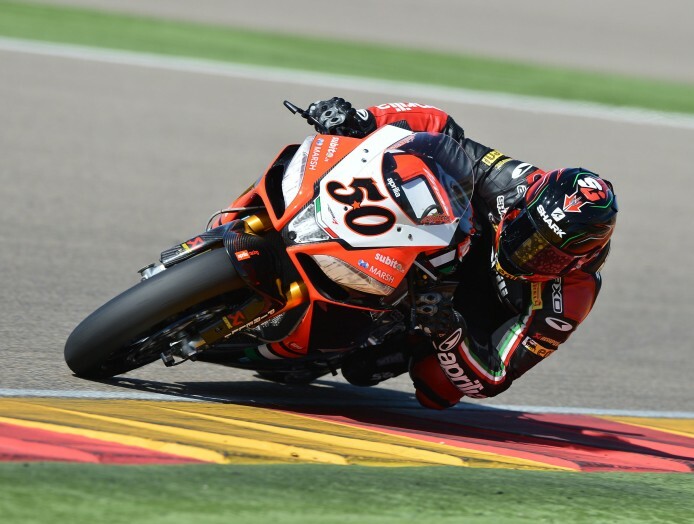 Aprilia Racing teammate Eugene Laverty will hope to put his disastrous weekend at Aragon behind him and move back to his podium finishing ways. After winning the opening race of the season at Philip Island and then finishing second in race two, Laverty went to Aragon confident of a good result. He secured pole position in Superpole however an electrical issue forced him to retire from race one and he crashed out of race two, resulting in zero points scored for the 26 year old. Laverty scored his first ever podium for Aprilia at Assen last season and is feeling positive:“I’ve put Aragon behind me and I’m thinking only about the remainder of the season. There’s no point in dwelling on it. Assen was the venue of my first podium finish on the Aprilia last year and so I have fond memories of riding the RSV4 around there. I really enjoy the flowing nature of the circuit and it usually makes for close racing. We know that the BMWs and Kawasaki of Tom Sykes will be strong but the Honda duo could be up there too”. Next Next post: Davies: "Assen has been good to me in the past"